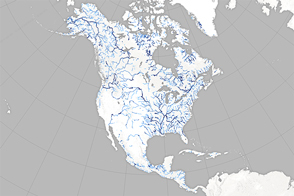 Arising from headwaters around Mount Robson in the Rocky Mountains, the Fraser River starts as a fast-moving stream. The river angles northward around the Columbia Mountains, picking up so much sediment that it appears brown by the time it reaches Quesnel. Near the coast, the river flows over flatter terrain, so it slows down and spreads out. On the final leg of its journey, the Fraser travels along the southern fringe of Vancouver. 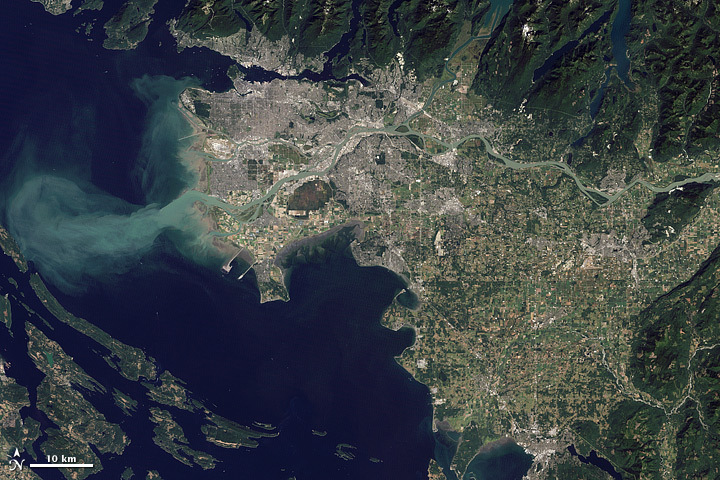 The Thematic Mapper on the Landsat 5 satellite captured this image of Vancouver on September 7, 2011. Flowing through braided channels, the Fraser River meanders toward the sea, emptying through multiple outlets. 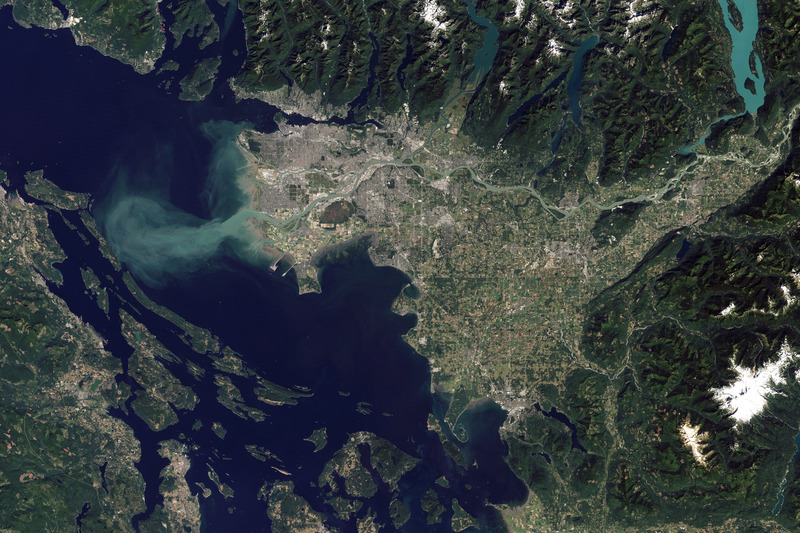 The river’s abundant sediment forms a distinct plume west of Vancouver, extending across the Strait of Georgia to the eastern shore of Valdes Island. In fact, the Fraser River carries an estimated 20 million metric tons of sediment to the Pacific Ocean each year. Some of it drops out of the water before reaching the ocean, and this steady delivery has contributed to the landscape of Vancouver. 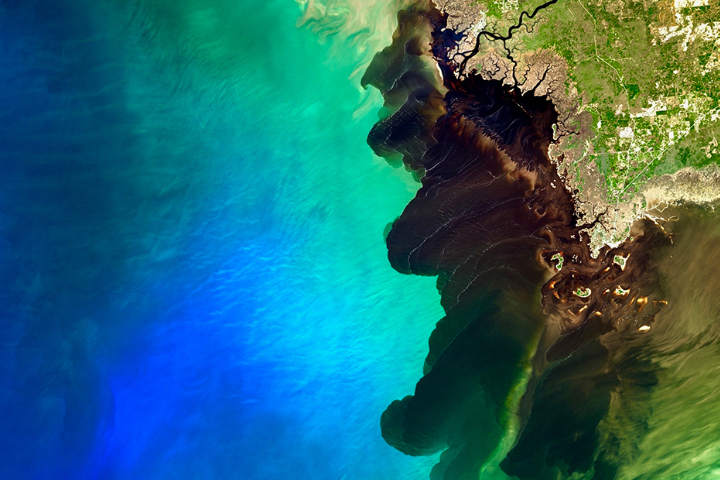 The muddy surface of the river often hides the complex, turbulent activity below. 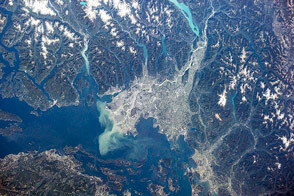 The mouth of the Fraser River is an estuary—a place where freshwater from rivers mixes with salt water from the ocean. But this estuary differs from some others in North America. In the San Francisco Bay, the Chesapeake Bay, and the mouth of the Hudson River, the mixing of salt and fresh water extends over miles. Near Vancouver, the mixing occurs along an abrupt front spanning just tens of meters. Although the swirling water and thick sediment can confuse salmon, the mixing also expels stagnant water and pollution and draws in oxygen. A salmon-rich river draining into a seafood-rich ocean likely played a role in human settlement along the Fraser. Artifacts in this region suggest that human occupation may have started as long as 16,000 years ago. Unlike many other rivers, the Fraser has not been dammed. 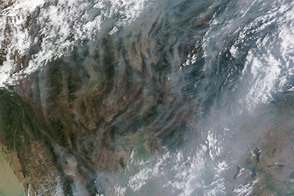 But it faces an indirect threat from pine beetle infestation; the subsequent removal of trees may warm the river water, making it inhospitable to the fish. 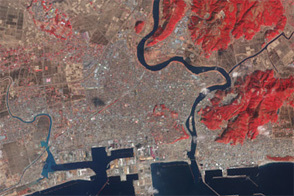 NASA Earth Observatory image created by Robert Simmon and Jesse Allen, using Landsat data provided by the United States Geological Survey. Caption by Michon Scott. Flowing past the city of Vancouver, the Fraser River delivers a thick plume of sediment to the Strait of Georgia. Fraser River Discovery Centre. (2009). Journey down the Fraser. Accessed February 20, 2012. Geyer, R. (2004, December 16). Where the rivers meet the sea. Oceanus Accessed February 23, 2012. Linder, C. (2012, February 18). Fraser River: Running Free. Woods Hole Oceanographic Institution. Accessed February 23, 2012. Tourism Vancouver. (2012). Vancouver’s history. Accessed February 20, 2012.